Some months ago I did blog about a method I use to find out what’s behind hardcoded export addresses inside a disasmed file (it’s available at https://zairon.wordpress.com/2013/09/26/hardcoded-dll-export-address/). It works fine, but talking with a friend of mine I did realize that the entire process is a little bit mechanical. He told me about a possible configuration tool, just to ease the system. I finally had the time to create an Ida Python plugin based on his comments, it doesn’t fully respect what he had in mind but credit goes to Kayaker of course. This is the plugin dialog, and it’s used to configure everything. The idea is to have some directories, one for every OS files you are interested in. In the image you can clearly view I was dealing with XP_SP2 dlls. The control at the top of the plugin is used to select a specific directory, all the next operations will be done inside it. All the information about every dll are stored inside a single txt file named ExportAddresses.txt. The file is automatically created by the plugin itself when you select a directory without that file inside. There are two listview controls inside the gui, the upper control lists all the available dll inside ExportAddresses.txt, the other one lists the exports inside a selected dll. The list view at the bottom is not really necessary indeed, but it can be usefull in case you need to have an idea about the addresses used by a specific dll. To add a new dll you can use “Browse for a new DLL to add” button. You have to select a txt file created by GetExportAddresses.py, the other python file inside the zip. The file takes a dll as input and it produces a txt file with the information about the exported functions: the address of the function, the name of the dll and the name of the function. To end the configuration process you only have to create the Python script able to check for the hardcoded address; just click on “Create GetExportedAddress.py” and the script will be created in the directory. With the use of this button you won’t have to change the path of ExportAddress.txt file each time you create a new OS dir. I haven’t added a script to re-solve all the possible hardcoded addresses because my idea is to solve few occasionally hidden addresses only. It’s nothing special indeed, it’s handy in case you have to deal with different Oss and you don’t want to do all by hand. Comments, criticisms, bug advices are always welcome, thank you. It’s really annoying when you have to deal with the initialization part of a malware, most of the time a malicious executable follows the same alloc/decrypt/jump_to_decrypted_code scheme. So, I decided to write something to ease and automate the initial process investigation of a malware. The idea behind the plugin is simple, Sequential Dumper is conceptually able to dump blocks of memory in sequence: it monitors the flow of the malware code trying to dump all the new allocated/decrypted parts in different memory areas containing code of the malware itself. The real malware is obtained after some tedious steps: a runtime allocated buffer is used like a bridge between the original and the real malware. The original malicious file is just used to decrypt a piece of code, and then this particular code will create the real malware replacing the old original file. A malware with this behaviour is available at VirusTotal. The left part of the image comes from a folder view, it shows the list of the files created by the plugin at runtime; the right part contains the logged data inside Ollydbg view. There are only two simple cryptic phrases by the plugin inside the log window, it’s pretty minimal in terms of information, but you don’t need anything else because you can understand how the code flow switches from a memory block to another. The first switch has been done from the original file to the block in memory, the other one is the jump back to the real malware. As you can see from the picture there’s a interesting message by Ollydbg “Unload C:\…”: the original malware doesn’t exist anymore, it has been overwritten by something else. What kind of files does Sequential Dumper create? 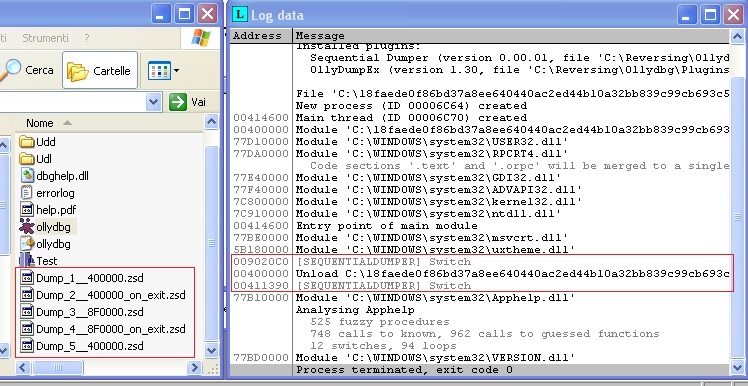 The listed files are raw dumps taken during the execution of the malware. Every single file has a name starting with “Dump_xx” where the double ‘x’ defines the creation order sequence. The last part of the name has two distinct forms, with or without “_on_exit” tag. I prefer to dump a block of memory before and after its execution because a decryption or a simple byte modification could happen in the middle of its code. Take in mind that a single dump will be performed if and only if the memory block has been modified. There’s also a checksum algorithm inside the plugin because I wanted to avoid duplicated dumps, if the accessed block of memory was already dumped you’ll see the switch log message only. Sequential Dumper is a two states plugin: enable or disable. In this first release the menu has two items only, the ‘About’ item and the other one which is used to activate the plugin. It’s not necessary to enable the plugin at the first instruction of the malware, you can activate it whenever you want. As you might guess everything relies on Ollydbg trace system, you have to run the debuggee in trace mode otherwise it fails catching a memory switch. The malware uses CallWindowProc to run a snippet from somewhere else, in this specific case the new code resides at 0x3900060. The address is outside the original exe and if you don’t allow Ollydbg to trace into system DLL the plugin won’t catch anything from the *hidden* snippet. I think you can understand why you might need to allow Ollydbg to trace system DLL. It’s not a rule but it might help. Sequential Dumper produces a sort of chronicle of the malware execution. It comes from a simple idea and it was born in few hours so don’t expect too much. Take in mind it’s the very first release and it may be exposed to bug. Just in case don’t hesitate to send a mail with detailed information about the bug. The plugin has some limitations but it could be helpful for someone, what do you think? Last summer I wrote two blog posts about Kins malware; the first one with a detailed explanation of the Kins’s Virtual Machine (available here), and the other with an introduction to the similarities between Kins and Zeus malwares in their initialization process (available here). I had in mind to write a final chapter about the argument, but I gave up because there were already a lot of discussions around the web about them. I stopped everything but I started to think of how could it be possible to check if a snippet from an executable is used by another program. So, today I’m going to introduce my SnippetDetector, a program able to recognize known snippets inside an executable. I know that there are some diffing tools available on the net, I haven’t tested all of them but I think mine is slightly different from the others (If I’m wrong don’t hesitate to tell me). The idea comes from a meditation over the term “Copy&Paste”; how many time did you Copy&Paste a piece of code? I bet you did it at least one time in your life. Think a little, the net is full of source codes, and if you don’t want to waste time studying something new you will copy and then paste the source inside your program. Believe it or not that’s the spirit of most developers, it’s an old news. Moreover, the possibility to put hands on leaked source codes will improve the usage of the Copy&Paste feature for the new born malwares. What will be the result? You probably will reverse the same function several times. That’s why I think my tool differs from the others: it uses a database storing snippets you have already been analyzed! The project involves an executable and some idc scripts because an interaction with IDA is necessary. Here are some practical examples to clarify all. To show you how it works I’ll use two malwares, Zeus and Kins. Is Kins using Zeus’s code? Suppose you spent a lot of time reversing a malware saving all the reversed snippets inside SnippetDetector database. What would happen if you need to reverse a derived malware? This is the perfect scenario for Zeus and Kins. 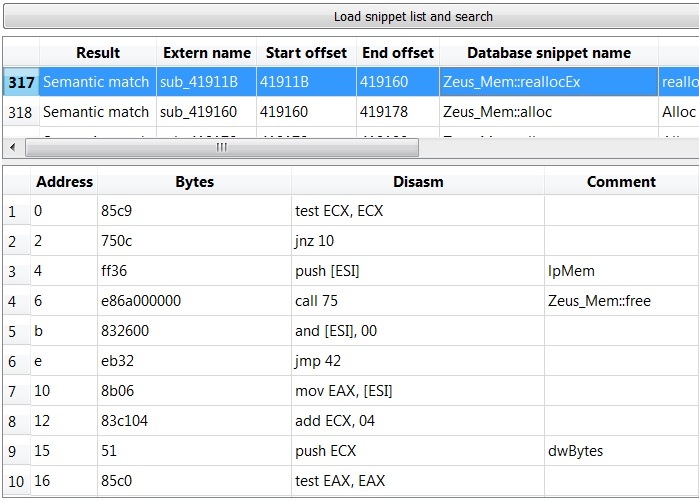 My detection database contains a lot of saved functions from Zeus and I want to check if SnippetDetector is able to reveal something inside Kins malware executable. It’s possible to send a sequence of snippets to SnippetDetector, the program will check if they are inside the database or not. The snippet list contains all the Kins functions. The list defines every single snippet using a specific structure; you can define the list by hand or using an IDA idc script. I’m lucky because SnippetDetector recognizes a lot of functions! This is only a little part of the output, there are a lot of positive matches indeed. 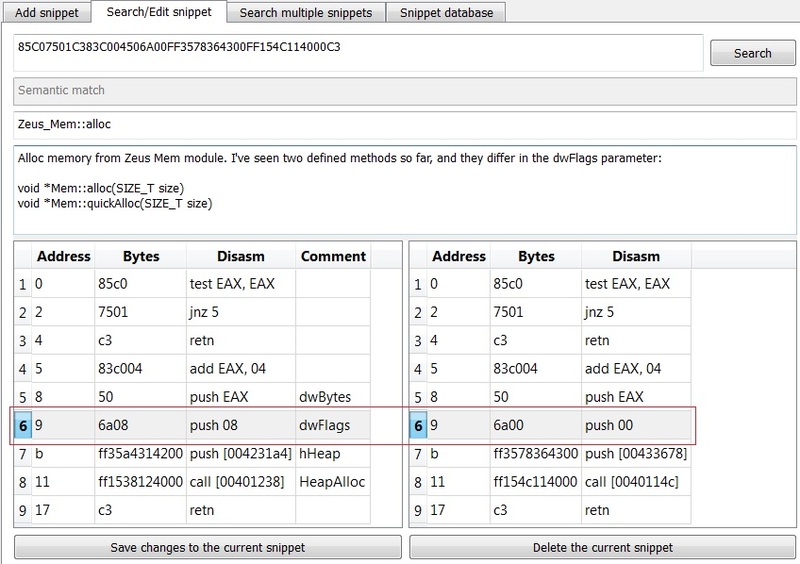 SnippetDetector contains his own disasm engine, it’s really simple but it does his job and it’s necessary because the detection of a snippet relies in his byte sequence. When I save a new snippet inside the database I can personalize the comment of every single instruction of the snippet, moreover I can load the comments directly from the output produced by IDA. 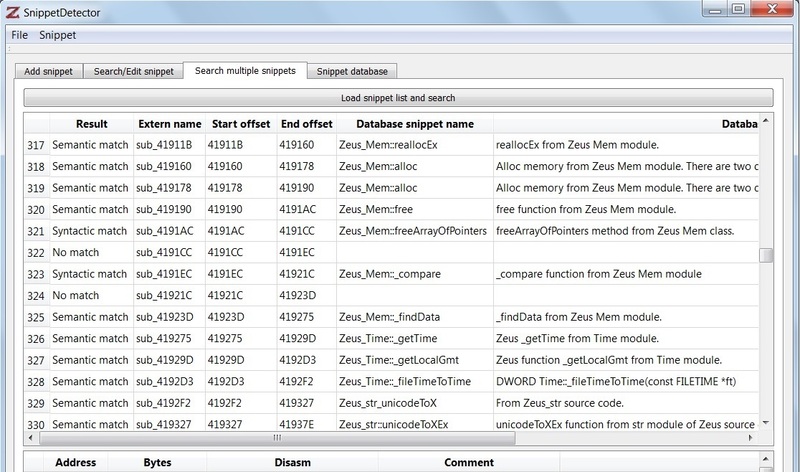 “Zeus_Mem::free” has been added at hand by me while the others (“lpMem” and “dwBytes”) comes from IDA. And now? Well, I can export the details of one or more snippet inside IDA. After that going back to IDA you’ll see “Zeus_Mem_reallocEx” instead of “sub_41911B”, and the code is also full of my comments. The disasm on the left comes from the database while the other one is one of the two snippets to check. The red delimited area reveals the arcane: “alloc” and “quickAlloc” are defined in the same way except for the dwFlags parameter. Semantically speaking the two functions perform the same thing: they alloc memory. That’s why I can have more than one functions marked by SnippetDetector with the same name. So, is it a false positive? In this case the tool can’t predict what the snippet does really but it can help you in the analysis process reducing your time passed over the code. Does it work for Zeus-Kins only or…? It works with every single snippet you save inside the database. Snippets could be loaded from Zeus, Carberp, a bug code (in case you want to see if it’s replicated inside some more files) or something else, basically whatever you want. 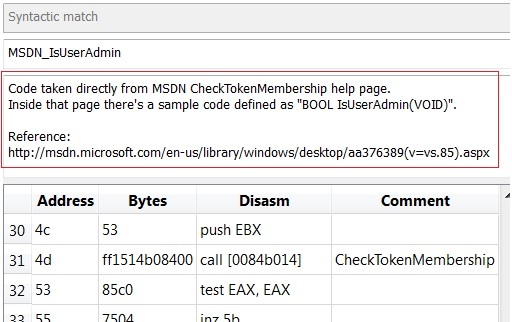 The malware uses a function that is a perfect Copy&Paste from MSDN help page of a specific function! I uploaded the snippet inside the database because I found inside a malware but I didn’t imagine to see it again. I know that a program can be compiled with different products and each one has a large variety of options but I don’t care about it, I simply used to save every single function I reverse. The power of SnippetDetector relies on his database: the more snippets you save inside it, the more accurate the detection will be. I have some more features in mind right now, I’ll let you know about it! Looking at the stats of my blog I’m always amazed by the “search terms” used to reach the blog because some of them are crazy, others are well formed, but there’s an interesting part of them that catches my attention: the questions. It’s usual to see people asking questions to their preferred search engine. So, why not start blogging answers? At the moment I only gathered some simple questions in my to-answer list but I hope to catch some more interesting ones in the future. Internet is full of online Base64 decoders/encoders, there are some specific tools too but some of them don’t produce valid results. 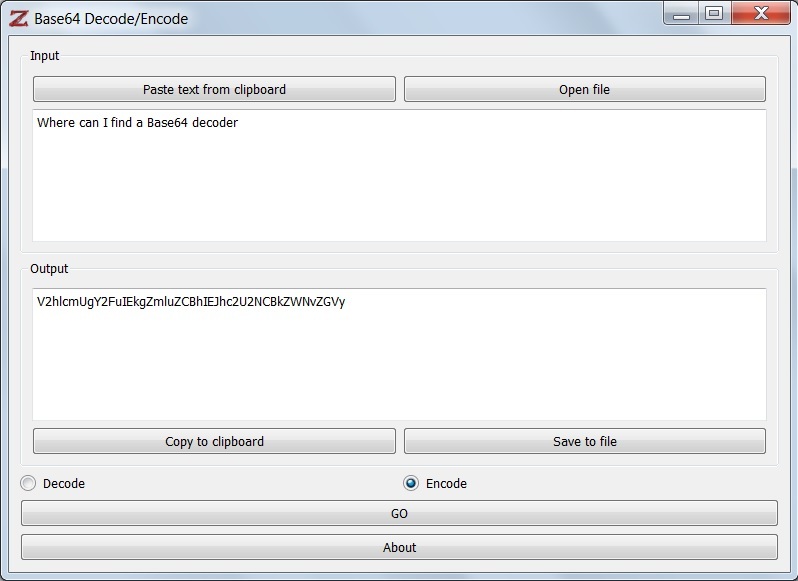 A local tool could be handy from time to time so here is a Base64 tool born in a short time simply using the power of Qt. Two months ago Halvar Flake announced a new malware challenge for female reversers only. I’m a man and I couldn’t submit a solution but I decided to give it a try, challenges are always funny. I shared this reversing session with Kayaker, so credit for this blog post goes to him too. The solution posted by Marion Marschalek (congratulations!) is pretty nice and it explains almost everything in details. I’m not writing a blog post with the same information she gave, but I would like to add something about the way I used to automatically naming/resolving the imported functions. To perform this switch I have written an IDC script. There are two functions inside it, GetAPINames and	ResolveAPINames. The first function is used to retrieve the name of all the hidden API while the other one will change the call instructions into a new readable version. The script stores all the information inside a structure named _API which is filled with all the API names. The structure is necessary and I’ll use it for some minor manual fix too. The way used to create GetModuleFileNameExA is pretty similar to the previous one but there’s a little difference, look at the opcodes. The mov instructions are similar but the ModR/M byte defines a distinct displacement. The instructions are checked byte by byte and the strings are created char by char. szChar is the current char to append to the partial string szAPI. The use of the structure is fondamental for the script. As you can see the letter ‘Q’ is obtained by a sequence of two instructions and my script is not able to catch it; it creates GetueuedCompletionStatus name. It has been proved that human brain is able to recognize word without few letters or with scrambled letters so I think I can pass over this minor problem! The malware uses a nice addressing method and IDA is not able to parse the hidden API but the nature of the addressing method lets us to solve the problem with some lines of code only. Now you can understand why the structure is the core of the entire script. GetTickCount has been resolved but the next call not. It’s obvious that esi points to the API at offset 0x1FC. You can solve it manually because the structure contains it. Right click over 0x1FC and select the line “[eax+_API.srand]”. Now you know how to manually fix special cases too.